Robert Silverberg’s novellas open the door to new worlds: In “Born with the Dead,” a woman wills her body to be “rekindled” after death, allowing her to walk among the living, while her husband is left in the impossible position of accepting her death when he can still see her. In the Nebula Award­–nominated story “Homefaring,” the time-traveling narrator finds himself trapped in the consciousness of a lobsterlike creature of the far future, leading him to reflect on what it means to be human. And in the collection’s Nebula Award­–winning title story, the Earth of the fiftieth century is a place where time is elusive and fluid, and young citizens live as tourists in ancient cities. 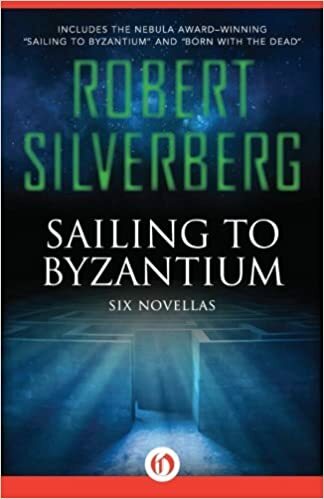 Together, the stories in Sailing to Byzantium form an engrossing exploration of the short-novel form by one of science fiction’s greatest writers. And then the Library! All those lost treasures, reclaimed from the jaws of time! Stupendous columned marble walls, airy high-vaulted reading rooms, dark coiling stacks stretching away to infinity. The ivory handles of seven hundred thousand papyrus scrolls bristling on the shelves. Scholars and librarians gliding quietly about, smiling faint scholarly smiles but plainly preoccupied with serious matters of the mind. They were all temporaries, Phillips realized. Mere props, part of the illusion. miserable evasion, cowardly, vile. McCulloch shivered. He imagined himself crying out, “We eat them!” and the water turning black with their shocked outbursts and saw them instantly falling upon him, swiftly and efficiently slicing him to scraps with their claws. Through his mind ran monstrous images of lobsters in tanks, lobsters boiling alive, lobsters smothered in rich sauces, lobsters shelled, lobsters minced, lobsters rendered into bisques—he could not halt the torrent of dreadful visions.